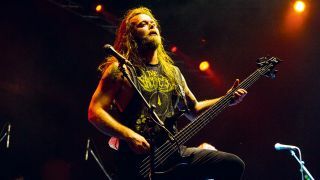 Mike Leon, who first came to the public eye with the band Havok, currently holds down the low end with Soulfly, the tribal metal band led by sometime Sepultura founder Max Cavalera. Tell us about the bass-playing on Ritual, Mike. Did pick playing ever appeal? “There were a few pick players that stood out to me when I was a kid, one being David Ellefson of Megadeth and another being Justin Chancellor of Tool, who has an undeniable pick tone. For certain techniques, like string-skipping, where you have to travel a certain distance holding a pick and route it accurately, I prefer to dedicate my thumb to one string and pluck the other one. That’s how I’ve always approached it. 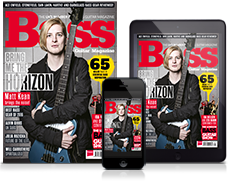 Did playing the violin help you when you became a bassist? Who were your influences on bass? “I always loved Flea. The first time I heard a Chili Peppers album I was like, ‘What in the hell is that sound? Is that even an instrument?’ and then I found out it was Flea. You’re one of the few bassists in extreme metal who performs string pops. “We open our set with a song called Frontlines. It’s very thrashy and it has a lot of string skipping, and where some people would just ride on the root note, I go note for note with our guitarist Marc Rizzo. I use my thumb as a drone note on the low E and then pluck the rest of it. “I’ve been with Peavey for five years now. For a while, I was using their all-tube VB3 head, with one of the matching 8x10 cabinets, and I also have a 2x15 of the same cab, but I’ve recently switched to using two of their little Mini Mega heads in a rack. You use some super-low tunings in Soulfly. “Yeah, a lot of our songs are down in B, so we’ll just skip down to the low string. Also, all three of us use a DigiTech Drop pitch-shifter for drop-tuning. You can dial it to take you down as far as an octave - it’s handy when you’re abroad and you can’t take extra basses for different tunings. We go down as far as A for some tunes. Ritual is out now on Nuclear Blast.